When Van Gogh was a young man in his early twenties, he was in London studying to be a clergyman. He had no thought of being an artist at all. He sat in his cheap little room writing a letter to his younger brother in Holland, whom he loved very much. He looked out his window at a watery twilight, a thin lampost, a star, and he said in his letter something like this: “It is so beautiful I must show you how it looks.” And then on his cheap ruled note paper, he made the most beautiful, tender, little drawing of it. 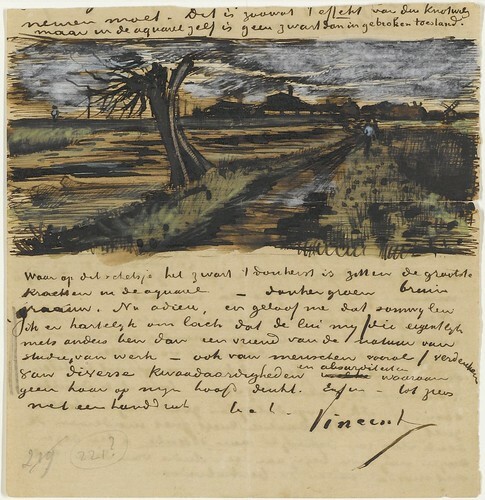 When I read this letter of Van Gogh’s it comforted me very much and seemed to throw clear light on the whole road of Art. Before, I had thought that to produce a work of painting or literature, you scowled and thought long and ponderously and weighed everything solemnly and learned everything that all artists had ever done aforetime, and what their influences and schools were, and you were extremely careful about design and balance and getting interesting planes into your painting, and avoided, with the most stringent severity, showing the faintest academical tendency, and were strictly modern. And so on and on. But the moment I read Van Gogh’s letter I knew what art was, and the creative impulse. It is a feeling of love and enthusiasm for something, and in a direct, simple, passionate and true way, you try to show this beauty in things to others, by drawing it. The difference between Van Gogh and you and me is, that while we may look at the sky and think it is beautiful, we don’t go so far as to show someone else how it looks. One reason may be that we do not care enough about the sky or for other people. But most often I think it is because we have been discouraged into thinking what we feel about the sky is not important. And Van Gogh’s little drawing on the cheap note paper was a work of art because he loved the sky and the frail lamppost against it so seriously that he made the drawing with the most exquisite conscientiousness he could. You and I might have made the drawing and scratched it off roughly. Well, that would have been a good thing to do too. But Van Gogh made the drawing with seriousness and truth. When I see young painters compose and draw from memory, and then haphazardly smear on whatever they like also from memory—then keep it at a distance and put on a very mysterious, gloomy face to find out what in Heavens’ name it may look like and at last finally make something from it, always from memory—it sometimes disgusts me, and makes me think it all very tedious and dull. They cannot understand that the figure of a laborer—some furrows in a plowed field, a bit of sand, sea and sky—are serious objects, so difficult but at the same time so beautiful, that it is indeed worthwhile to devote one’s life to the task of expressing the poetry hidden in them.